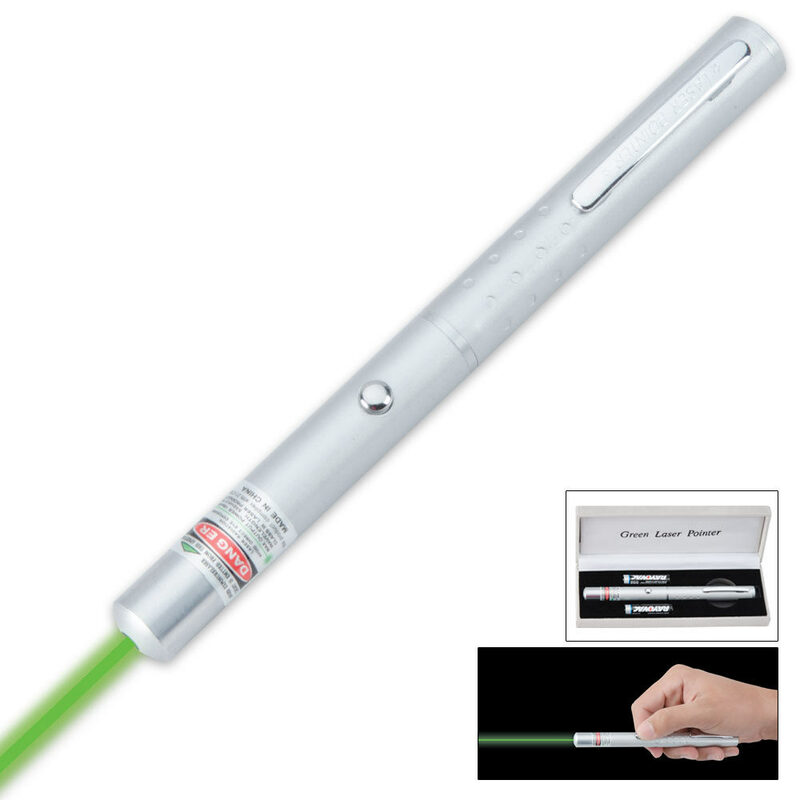 Bright Green Laser Pointer - Shines Nearly 1 Mile | BUDK.com - Knives & Swords At The Lowest Prices! That's right! This class IIIA laser device reaches 1,500 meters - a little more than 9/10 of a mile. It's the same type of laser used by bomb squads to point out threats from a safe distance. More than twice as bright as red laser pointers, the entire brilliant green beam - not just the dot - is clearly visible in dark conditions. Imagine the possibilities! I have 3 laser pointers two red and now a green one. The green one is the best I have. 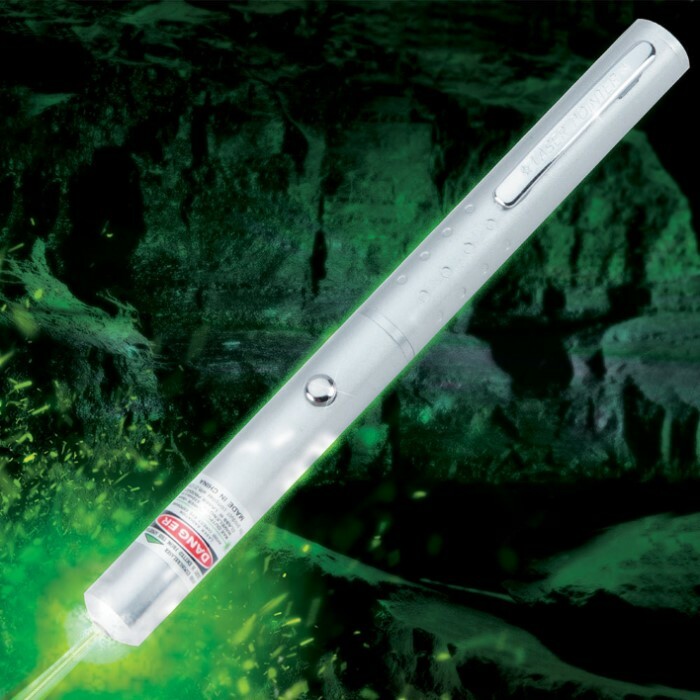 If you are considering a laser pointer this is the one you want. These things are fun. A great thick laser that goes a long distance. The cat loves it too! Very impressed. Great buy strong green laser goes a long way! Creates an awesome green beam that seems to go on forever. People are always impressed by it. Feels sturdy and slick. My only complaint is the button seems janke and you have to whack the laser to get the beam to show up. Like it's on high or low power and you need to fiddle with it. Annoying when you are trying to impress people. Other than that, very good. 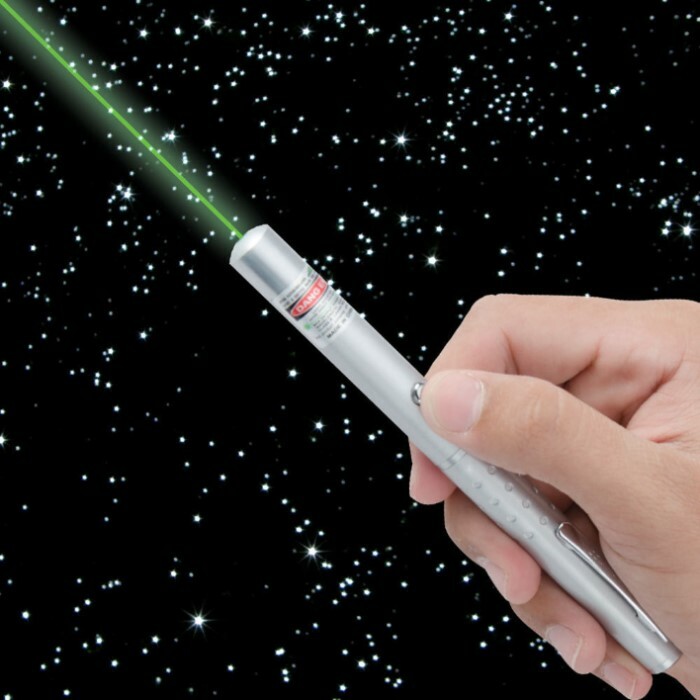 Great Laser Pointer only reason four instead of five stars - eats batteries in 48 hours of heavy use. Still a solid product. It is very impressive! The Beam is much more intense than I would have imagined.It is all it says it is. Very Happy with it. This thing is pretty sweet. Very bright and very powerful. The design of the pen i got was slightly different than the one in the picture, but not enough to cause discrepency. The batteries that came with it sucked so don't trust them. As for the beam, its there but not nearly as bright or wide as it seems in the picture. The best way to see it is in a completely dark room or at night with no lights on. Another fantastic buy from true swords! 2 weeks after i got it the laser inside the pen tube started to come loose and withing 2 and a half i had to oaky rig it. It broke today and went kaput. its great if it lasts. Very powerful pointer and looks cool, too! I just got this lazer today. I was a little worried that it wasnt going to be what the description said. Well, the description nailed it exactly, this lazer is amazing and is really worth the price. YOU CAN SEE THE BEEM OF THE LAZER IN THE DARK! if you order one of these lazers and dont see the beem (in the dark) when you first open it the batteries might be a little dead. My were not though, the batteries it came with are brand new. I love this thing! Thank you true swords!